SCHOHARIE, New York -- Twenty people were killed in a "horrific" limousine crash in upstate New York in what investigators are calling one of the "most deadly" transportation accidents in years. On Tuesday New York State police identified all the victims. 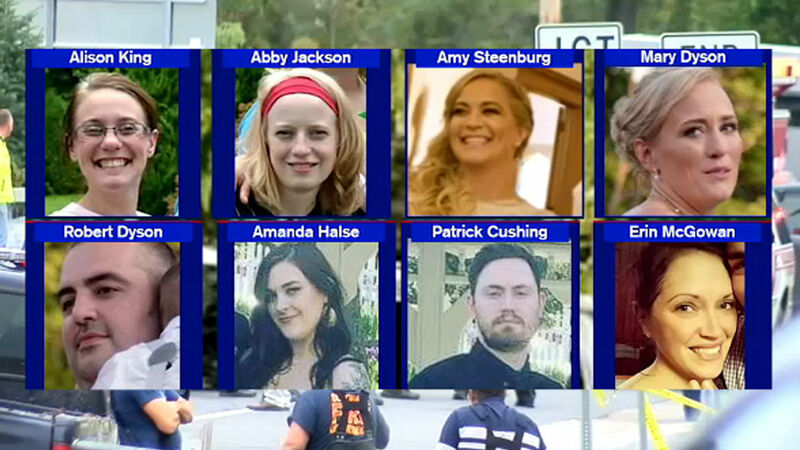 The limo crash in New York ranks among the deadliest traffic accidents in U.S. history. Take a look at some others. Eighteen of the victims were in a 2001 Ford Excursion limousine, which crashed into a parked 2015 Toyota Highlander in the parking lot of the Apple Barrel Country Store in Schoharie, N.Y. Two of the victims were pedestrians, according to New York State Police. Michael Ukaj was in the Marine Corps and served a tour in Iraq. Amanda Halse was killed, along with her boyfriend, Patrick Cushing, 31, according to her sister Karina Halse. Karina said Amanda was an artist. She called her "the most beautiful soul" and that Amanda "lived her life to the fullest every single day." Karina Halse told ABC News her sister texted her soon before the crash to say she was taking a limo somewhere. Karina said Amanda and Patrick had earlier that summer attended the wedding of two other victims - Shane and Erin. Karina said her sister was a plant lover who worked as a waitress at Shaker Point in Watervliet. The limo was headed to a brewery in Cooperstown, N.Y., Karina, who visited the crash site Monday, said. The last time Karina saw her sister alive was the prior weekend when they and their mother traveled to a plant store in Vermont, she said. "My heart is sunken. It's in a place where I've never felt this type of pain before," said Karina. Karina said Amanda and Patrick were like "two peas in a pod" and had been dating about a year. Cushing was on the men's U.S. Dodgeball team. U.S. Dodgeball posted a statement to their Facebook page saying Cushing "represented the very best of America." To honor Cushing, U.S. Dodgeball announced it will retire his number 98. The Times Union reports the couple had been married five months. Abeling says her daughter had been invited along but was unable to go. She says the family has not learned much about the circumstances of the crash. She says "our lives have been changed forever." Grief counseling is being offered at the Amsterdam school district where 34-year-old victim Abby Jackson was a teacher. The Greater Amsterdam school district released a statement offering its condolences and grief counseling for those in the community. Abby Jackson and her husband Adam, 34, leave behind two daughters, Archer, 4, and Elle, 16 months old, the Times Union reports. The Times Union reports Amy and Axel Steenburg, both 29, were just married in June. Axel and his brother Rich Steenburg, also killed in the limousine, both worked at GlobalFoundries. Barbara Douglas, the aunt of the four sisters killed in the crash, told the Associated Press the group was out celebrating Amy's 30th birthday - she was the youngest of the four sisters. "Axel, you have showed me what true love is. I dream of us going old and traveling the world hand in hand. I love you always," Amy Steenburg said a wedding video her aunt shared with Good Morning America. Amy posted a selfie of her with her husband just three days before the accident, writing on Facebook, "I just wanted to say Axel Steenburg I love you more than words can say!" Rich Steenburg ,34, leaves behind a 10-year-old daughter and 14-year-old stepson. His wife did not come along because she was not feeling well and stayed home. Douglas identified Mary and Rob Dyson and Allison King, 31, as the other two sisters and brother-in-law of Amy Steenburg killed in the crash. Mary was 33 and her husband was 34, New York State Police said. Amanda was 29 years old and from Colonie, NY. Rachel was 30 years old and from Waterford, NY. Savannah was 24 years old and from Broadalbin, NY. Matthew was 27 years old and from Johnstown, NY. One passenger in the limo remains unidentified at this point. Lisinicchia, 53, of Queensbury has been identified as the driver of the limo. 46-year-old Hough was killed in the parking lot. Schnurr, 71, was Hough's father-in-law. He was with him in the parking lot at the time of the crash and died.